Pastel Tassel Garland 9 Ft.
A Baby Girl Prismatic Banner 12 Ft.
Birthday Princess Prismatic Banner 12 Ft.
Birthday Girl Prismatic Banner Short Fold 12 Ft.
Birthday Girl Prismatic Banner 12 Ft.
Birthday Boy Prismatic Banner Short Fold 12 Ft. Happy 9th Birthday Prismatic Banner 12 Ft. Happy 8th Birthday Prismatic Banner 12 Ft. Happy 7th Birthday Prismatic Banner 12 Ft. Happy 6th Birthday Prismatic Banner 12 Ft. Happy 2nd Birthday Prismatic Banner 12 Ft.
Birthday Burst Giant Jointed Banner 41?2 Ft. 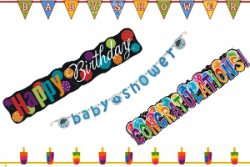 Boy Bottle Giant Jointed Banner 41?2 Ft.
Birthday Cheer Giant Jointed Banner 41?2 Ft.
Birthday Pops Giant Jointed Banner 41?2 Ft.
Baby Shower Giant Jointed Banner 41?2 Ft.
Congratulations Giant Jointed Banner 41?2 Ft. Pastel Happy Birthday Letter Banner 9ft. Baby Bootie Blue Paper Garland 9 Ft.
Baby Onesie Paper Garland 9 Ft. Designer Birthday Plastic Flag Banner 12 Ft. Happy Birthday Plastic Flag Banner 12 Ft.
Birthday Sweetsplastic Flag Banner 12 Ft.